Your mattress may be the cause! Do you suffer from asthma or other health senstitivities? Are you often waking up with a stuffy nose or allergy symptoms? Have you developed skin rashes that don't want to go away? Beds are a prime habitat (where 1/3 of life occurs). A typical used mattress may have anywhere from 100,000 to 10 million mites inside. 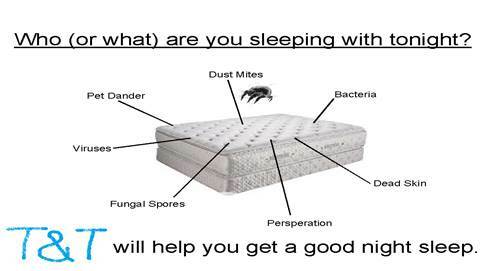 Mites prefer warm, moist surroundings such as the inside of a mattress when someone is on it. A favorite food is dander (both human and animal skin flakes). Humans shed about 1/5 ounce of dander (dead skin) each week. About 80 percent of the material seen floating in a sunbeam is actually skin flakes. 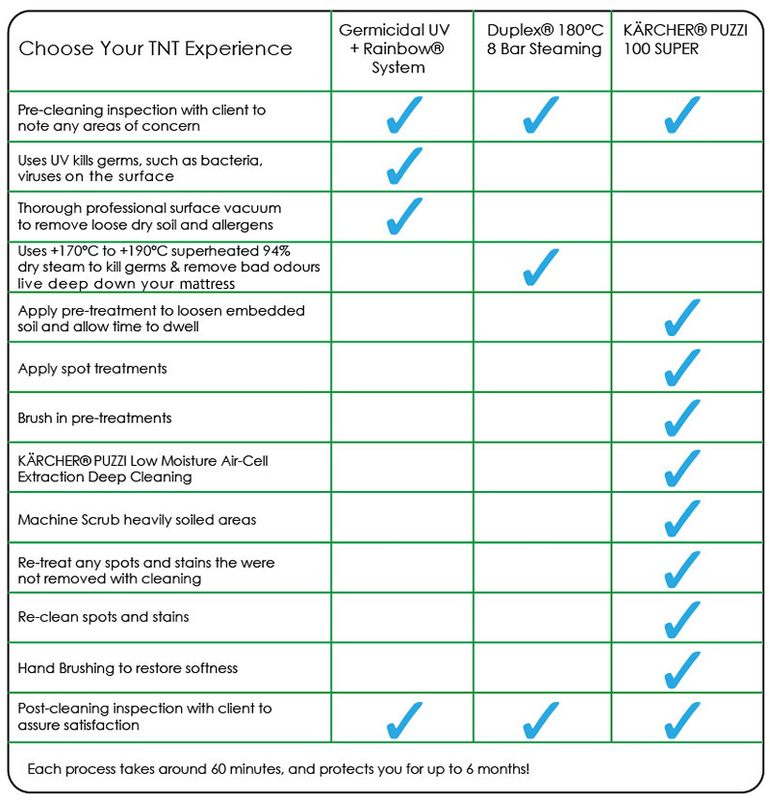 Mattress cleaning is one of the most overlooked home cleaning services provided today. Most people don't realise that having their mattresses cleaned regularly helps improve air quality, remove allergens, and remove contaminants. 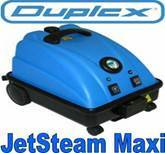 Mattress cleaning is also a highly beneficial treatment if you suffer from asthma. The Rainbow® Power Nozzle has a motorized brush helps loosen dust mite, feces, pet dander, pollen, spores from your mattresses for easy pickup. Furthermore, Ultra-Violet light ONLY sanitizes the very top of the mattress or sofa surface where the light hits. Dust Mites, Bacteria, Germs, and Viruses live deep down in the body of the mattress and crawl to the surface as they sense the body heat of someone lying down. The principle of KÄRCHER® PUZZI 100 SUPER spray extraction system sprays water deep into the mattress's / sofas fabric, while simultaneously vacuuming the used solution back again to free embedded soiling and particles deep down - not just those embedded on the surface. KÄRCHER® PUZZI 100 SUPER works using the rinse extraction method of cleaning – the proven most thorough and hygienic method available. Cleaning solution is spray injected (via the PUZZI 100 SUPER low-moisture internal spray hand tool), into the soiled mattress / sofa, then immediately sucked out into the Spot Masters recovery tank. Step one: vacuum out hair, crushed potato chips, etc of the object. Step four: using our professional KÄRCHER®PUZZI100 SUPER for extracting the mattress / sofa with biodegradable solution, this process can extract all of the dirt out of the items. After finished this process, your items will smell good and fresh. Each process takes around 60 minutes, and protects you for up to 6 months! You now have a Safe and Healthy mattress for You, Your Family, and Your Guests to sleep on...and Peace Of Mind!